While it looks like an APS compact film camera in the mid 90’s or even a digital point-and-shoot today, the Olympus XA is actually a “full frame” 35mm rangefinder camera introduced in 1979! The XA is one of the smallest 35mm rangefinder cameras ever made, it could even be the smallest of the smallest (anyone who can confirm this will be greatly appreciated). Also, information on the design history of the XA shows that this little camera is the result of genius engineering of its era. First of all, the XA shutter, with a speed range of 10 seconds – 1/500 seconds, is so highly precise and compact that it requires a very small magnet to operate. This magnet is so small that no commonly used material at that time is suitable and a rare earth element is needed to be used! Also, the XA has a “feather touch” shutter release that reduce camera shake which is usually associated with small cameras. Another important technological highlight is the XA’s lens. This little F. Zuiko 35mm f2.8 lens is not a simple 4-element Tessar (as many would guess) nor a collapsable design like the Rollei 35 and Minox 35. It is indeed a complicated 6-element/5 groups reversed retro-focus design that can reach a resolution comparable to many pro-quality full size 35mm lenses. The XA is a aperture-priority only camera. To do exposure compensation, you can either use the +1.5 stop switch at the bottom of the camera (the same switch also functions as battery check and self-timer) or use the ASA film speed dial to get more precise compensation up to 1/3 stop per step. Another neat feature is the chosen shutter speed is displayed in the viewfinder which is a feature welcomed by many photographers. Unlike many other compact cameras, the XA does not have a built-in flash probably due to its small size. So instead, an attachable accessory flash is used. 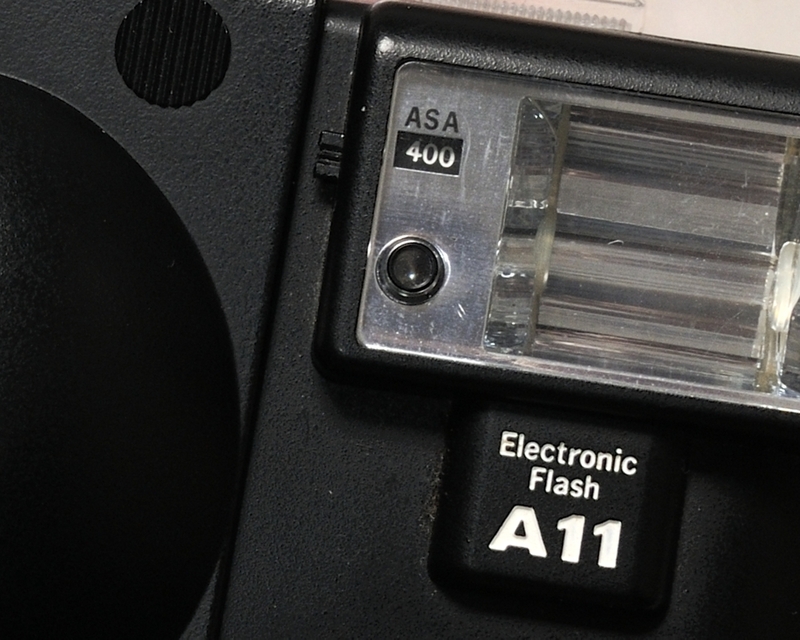 The A11 flash in the photo above provides automatic flash for ASA100 and ASA400 with a guide number of 10. You can also fire the flash in full power manual mode. The A11 is so small that it uses only a single AA battery but it also takes a full 7 seconds for each recharge! There is a more powerful flash called the A16 available with a guide number of 16. However, it requires two AA batteries and its size is more than half the size of the camera itself. In my opinion, it totally defeats the super compact design of the XA. XA1 (1982) – battery-less fully automatic exposure by using a selenium meter, 35mm f4 fixed focus lens, dedicated flash A9M (miniaturized A11). XA2 (1981) – battery powered fully automatic exposure, 35mm f3.5 zone focus lens, different colors available (an edgy marketing scheme at that time). 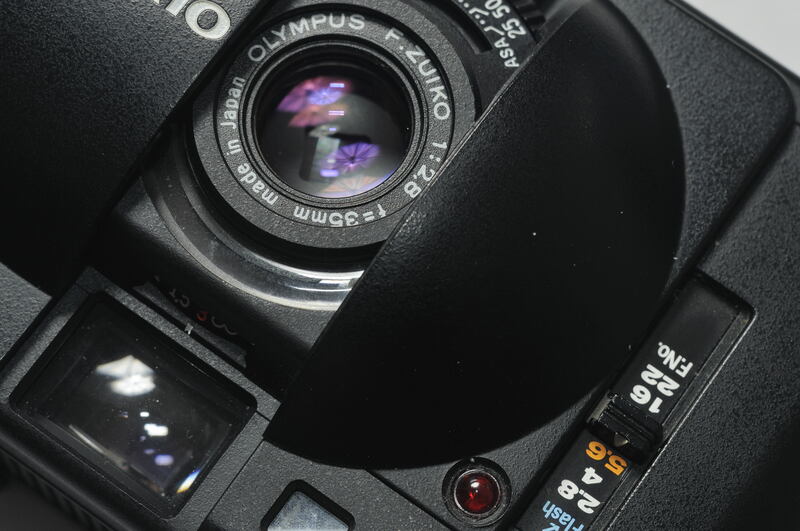 XA3 (1985) – basically a XA2 with automatic film speed setting for DX-coded films and manual film speed setting up to ASA1600 (XA only capable of up to ASA800). XA4 (1985) – a XA3 with a 28mm f3.5 wide-angle lens capable of close focusing up to 0.3m (XA only focus to 0.85m), low power dedicated flash A9L for close up which uses a non-user-replacable lithium battery. Below are two photos taken with the XA, one using Fomapan 100 and one using Fujifilm XTRA 400. Note the colors in which the XA lens produced in the second photo, in my opinion, it is kind of like the result of a Leitz Summicron-M 35mm f2 (a good friend of mine once lent me his M4-2 for a test-run after CLA). I bought this camera from a used camera store via the Internet. It is the first camera I have bought online and delivered via mail. The store sent me detailed photos of the camera before I made the purchase and the staff is quite knowledgable which gave me confidence in making up my mind. It was my intention to use the XA as a daily carry-around camera. Indeed, I have used the camera for street photography, fine art project and even travel photography. To me, if I need to shoot high-quality landscape photos while I am high in mountains and on rough terrains in which the situations prohibit me to carry a medium format or even a 35mm SLR, I would bring the XA along and load it with Ilford Delta 100 or even Pan F 50. This entry was posted in Rangefinders. Bookmark the permalink. The XA was introduced in 1979,not 1975.Very capable camera. Thanks for pointing that out (my typo)…already corrected it.